By addressing issues related to mitigating climate change, cities are reaping fiscal, health benefits. Actions to reduce Greenhouse Gas (GHG) emissions and increase energy efficiency are making cities healthier and wealthier, according to a new report. Released by the Carbon Disclosure Project, in association with AECOM and the C40 Cities Climate Leadership Group, the report highlighted 110 cities’ efforts to limit the impact of climate change. It found the majority of cities involved reported social and economic benefits from such actions. Reduction of energy consumption is one of the main ways cities across the globe are reducing carbon footprints, and at the same time saving money. The three ways by which cities are achieving this, according to the report, are by reducing energy demands in government buildings, improving fuel efficiency in municipal fleets and lowering the energy consumption and maintenance of outdoor lighting. Los Angeles, for example, retrofitted 4,400 traffic signals and 100,000 streetlights with energy efficient products, saving $11 million per year in electricity and repair costs. Houston, Texas, replaced incandescent bulbs at all signaled intersections, and realized a savings of $10,000 per day. Washington, D.C., retrofitted 5,400 residential buildings owned by the D.C. Housing Authority, saving $3.9 million in electricity costs as well as $2.4 million in operations and maintenance costs, according to the report. Savings associated with energy efficiency aren’t the only economic benefit cities are enjoying. According to the report, research shows that new businesses can often be attracted by investmenting in public transit, increasing green space and building infrastructure for walking and cycling. New York City reported, “Energy efficiency initiatives will result in new clean tech businesses.” Houston, Texas, expects that its $4 billion investment in its light rail expansion will bring economic benefits for residents of the city. Dallas, Texas, has seen the number of “green” jobs rise as GHG emissions fall. The report found nearly every reporting city understood climate change action to promote economic opportunity – a sharp rebuke, according to the report, to those that criticize green action as being anti-business. In all, 71 cities reported development of new business industries, 45 increased attention to environmental concerns, 39 increased efficiency of operations, 38 increased infrastructure investments, 32 reported additional funding opportunities and 31 increased energy security. 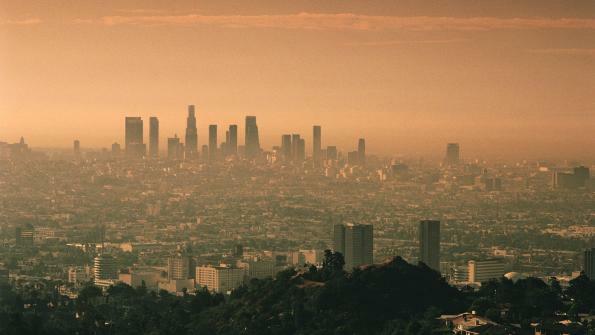 Efforts to improve air quality are also leading to healthier residents, according to the report. Particulate pollution, given off by manufacturing plants and automobiles, is the leading cause of asthma and respiratory illnesses. Chicago and New York are both closing down and replacing obsolete coal- and oil-burning manufacturing plants, and Los Angles has synchronized 100 percent of its traffic lights, reducing the amount of time drivers spend on the road, and keeping an estimated 1 million tons of carbon dioxide and particulate emissions out of the atmosphere. Expanding cycling and walking infrastructure is another way cities can reduce GHG emissions while improving the health of residents. Chicago’s Divvy Bike program and New York’s Citi Bikes are both examples of such programs. Download the .PDF to read the full report.